If you have only 10 email addresses, it might be fairly easy just to arrow to the end of each line, hit delete, and type a comma, but if you have 20, 100, or 1000 email addresses, that would simply be a waste of time. A smarter way to do this would be to do a find and replace on end-of-line characters substituting commas. You could accomplish this with any text-editor that allows regular expression search, such as Textmate. This inserts whatever was captured by the first set of parentheses (viz. m) and a comma. Clicking Replace All converts linebreaks to commas for all lines ending with m.
This is a somewhat trivial example that doesn't do full justice to the power of regular expressions, but if I could recommend one piece of programming knowledge to non-programmers, it would be "learn regular expressions." I use them constantly to automate tedious tasks and they've saved me countless hours. 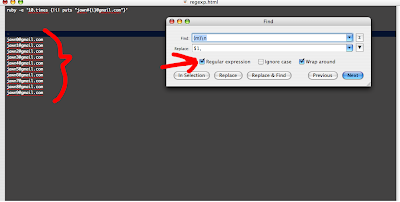 This page has some great info on how to use regular expressions, and I recently discovered a web-based regular expression tester inspired by the magnificent RX-toolkit in Komodo IDE that is a great place to experiment with regexps. You can enter in some sample text to search, then try writing regular expressions and watch them match as you type in real time--indispensable!